Happy Easter friends and soon to be friends! I hope you all get the chance to relax and get in some good quality time with your family this weekend. Some of you may know that I lost my little brother a little over 4 months ago. I'm now reminded now more than ever how precious holidays and the times we get to spend with are families are. I'm thankful for memories l have. 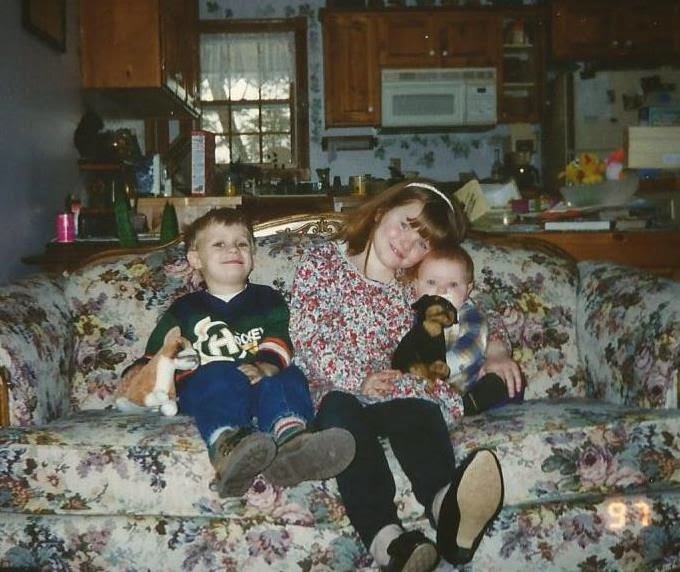 The picture above is a memory that I've had in my head all week from Easter of 1997. Back when we were all so little and before I learned how to properly smile for a picture. Even though we broke all of our Easter traditions that year and spent Easter away from home and with relatives we normally didn't spend Easter with, it didn't matter. The day was still full of great memories. That puts into perspective for me that traditions aren't the most important thing. I mean I love traditions, but it's the people we spend our time with that make our memories great, not what we do when we're with them. I'm thankful that I have so many good memories to look back on. I'm thankful that I am part of such a strong and loving family. I'm thankful that as time passes the good memories bring more and more smiles.